Why Do We Need Drupal Support? 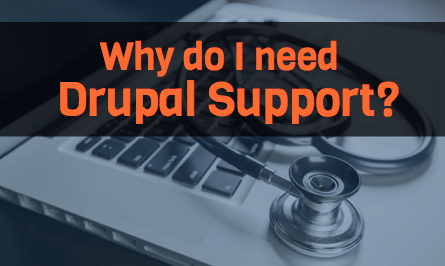 Why do I need Drupal Support? We need Drupal Support because things change. Software develops rapidly, and the same goes for Drupal and its many modules. IT decision managers everywhere find themselves asking questions like this one. Right now, many site managers are talking about the need for Drupal support team options and services, ever since Drupal 6 End of Life and Drupal 6 Long Term Support came about. With Drupal support, we're protecting our web site. An analogy could be made here with getting sick or being exposed to serious illness. Bad things can happen to us unless we're taken care of; for our websites, it's the same. So when do I need Drupal support? We can never be sure when we’ll need it. But when the time comes if you don’t have Drupal support services, recovery can be pretty painful. Servicing depends on your situation. The best case scenario: When our site gets more popular, we'll need to increase our server capacity. This could be super easy or pretty complicated depending on what we’re looking at, creating a distributed environment, adding CDN support or caching, or implementing performance optimizations. For regular checkups: Like a medical checkup, our site needs maintenance now and again. Routine support with support services takes care of database repairs, temporary file cleanups, deleting unwanted spam comments, junk entries and more. Software changes: Here’s a real world example: we’re using Facebook login, and we find out they’re going to drop support for old APIs—like the ones we’re currently using. This scenario is one that makes Drupal support useful because third party integrations are common on websites. These need to be periodically updated, or they stop working for us. Potentially, even disabling it. New Drupal versions: Drupal upgrades include more than new functionality, like security updates and bug fixes that help make a site robust and secure. Without these improvements, we're bypassing serious improvements. For example, Drupal 8’s new features like its mobile, global capabilities. Complex content: Some site managers need to publish a new event or product on their website and need a specialized content page with a different structure. Interestingly enough, NVIDIA has a dedicated support team of Drupal just to manage content and to do site maintenance for Drupal sites like made2game.com. While they can afford it, small and midsize companies probably can’t. The good news is scalable Drupal support options for things like these situations. New toys: New features and functionalities key decision makers want to see happen can be applied with Drupal Support services. Of course, this depends on the size, but with options like flexible Drupal staff augmentation, we don’t have to worry about impromptu changes or new additions. I want to do Drupal Support myself. Well, first off we’ll need to keep our finger on Drupal's pulse and know right away when an update becomes available. We’ve got to know our stuff. We need to find out what's in our site’s code. We also need to know what it does and how. For instance, there may be three contributed modules doing a task for us or custom code doing the job. Unless we know which modules are used and which libraries, we won’t be able to check from outside. Follow Drupal Security for the security updates, but we might not know which ones apply to ourselves. Checking the Drupal updates page is another way; we only need to have the update module enabled. This module gives warning and shows message to site administrators. But keep in mind, we may want to hide those messages from the marketing team by disabling it on production, yet always on for dev instances. We need a handle on the basics at the very least. If I don’t get Drupal Support, what could happen? With Drupal support we can protect our website and embrace needed changes. Without it, we’ll get the opposite. It’s possible that eventually our site might not be rendered on new generation browsers and devices. It might crash or get seriously slow because of large amounts of old data in need of archiving. Our organization will be open to hackers, reputation issues, along with site and server accessibility problems. All of these and more will be at stake.